A lot of people believe that the turning point in Game 5 of the Western Conference Semi-Finals showdown between the Los Angeles Clippers and the Oklahoma City Thunder was the out-of-bounds call with 11.3 seconds left to play in regulation involving OKC's Reggie Jackson and LAC's Matt Barnes wherein the referees gave the ball possession to OKC despite the inconclusivity that they saw on the replay. 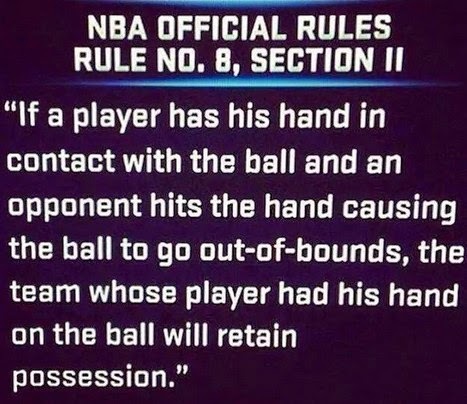 The controversial call happened while OKC was trying to cut down the lead of the Clippers and the replays clearly showed that Matt didn't touch the ball, yet OKC still retained ball possession. That caused a lot of buzz around the league, but apparently, there's a rule that governs and validates such referee decision. Be prepared because this will blow your mind. "If a player has his hand in contact with the ball, and an opponent hits the hand causing the ball to go out-of-bounds, the team whose player had his hand on the ball will retain possession."